Redness of the cheeks can be endearing especially when it happens when you’re cold or when you’re embarrassed, but if it becomes permanent, and very pronounced, wouldn’t it be such a bother? Couperose is a condition wherein the skin on the face becomes red due to broken capillaries. Couperose is often confused with Rosacea, which is also characterized by redness on the skin but is caused by inflammation of the cheeks, nose, chin, and forehead and can also cause acne-like appearance of lumps and bumps. 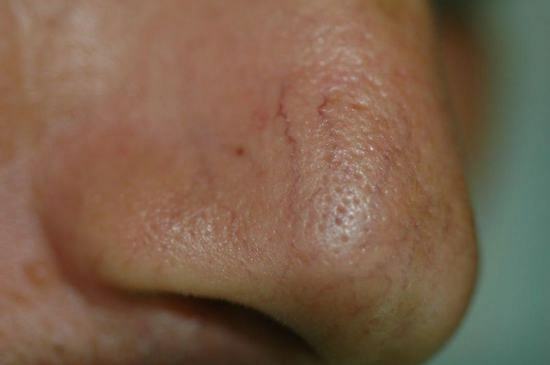 Spider veins are small dilated blood vessels near the surface of the skin that also appears more commonly on the face around the nose, cheek, and chin but can also appear elsewhere. Both Couperose and Spider veins causes visible redness and discoloration on the area it affects and are both conditions caused by vascular changes. At Yoskarn Clinic, we recommend vascular lasers for patients who are concerned with Couperose and Spider Veins. Several types of vascular lasers are available at Yoskarn Clinic such as copper bromide, pulsed dye, long pulse ND Yag, and intense pulsed light (IPL) . Our doctor will choose the type of laser is best for your skin and the type of your veins. Vascular lasers are the type of lasers that penetrate the outer layers of the skin to reach the blood vessels and destroy them with brief but intense heat. The procedure usually causes bruising which resolves in a few days time. Topical anesthesia may be applied before the treatment to ease discomfort. Laser treatments may be a bit painful and stingy because of the heat. Different patients may again respond differently from one another in terms of result so our dermatologists and Prof. Somyos Kunachak may recommend different lasers depending on your skin type and history with laser treatments. Please note that with laser treatments, a possibility of more than 1 session needed to achieve the result desired may be necessary. A rest period of 4-8 weeks may be recommended depending on the response of the patient to the treatment. Also remember that even after all the redness has evened out, there is a still a chance of recurrence. Application of cool compress may help reduce the discomfort after the treatment along with the redness on the area that was treated. Blisters may form which may also cause scabs. These will eventually fall off naturally so you should never scratch it off. For those with severe spider veins on the legs and thighs, compression stockings may be recommended for a week after the procedure. Taking a bath is not prohibited but rubbing the skin especially the treated area should be avoided. Hot baths and the use of the sauna should be avoided for 10 days. Make-up may be used on the day of treatment but direct sun exposure, tanning beds and tanning lotions should be avoided for 4 to 6 weeks after treatment, or until the crust has fallen off, otherwise pigment defects (light or dark spots) may appear in the treated area.